The Bradford Rattlers will be announcing player signings over the coming weeks. Already announced earlier in the summer was star goalie Bradley Hampton from Thunder Bay, Ontario. Re-signing this week was young Russian forward Khassan Al-Dzhilaui. Khassan, 17, will be entering his third season as a Rattler. Last season, at just 16 years of age, the Russian winger put up 35 points (12g, 23a) in 35 games. Khassan was an Assistant Captain last season. Al-Dzhilaui has been training with the Rattlers organization since he was 12 years old, participating in youth training camps before joining the big club in 2014. 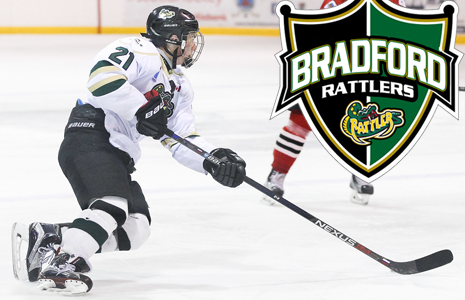 The 17 year old hails from Moscow, Russia and has been spending his off-season in Bradford training on the Rattlers AAA Prospect team. He will remain in Bradford until the end of June, training with the club. The Rattlers have made several huge signings to be announced in the coming weeks. Nine players have re-signed with the club from last season to pursue the Russell Cup this season.